One of the common arguments against the concept of a socialized America is that it places too much government control over people and their personal rights and freedoms. These critics claim that socialism will end with an America full of mindless zombie robots and the federal government holding the remote control. Yet we have seen recently that elected leadership and private corporate interests in the United States can trample not only constitutionally protected freedoms but basic, undeniable human rights, such as access to clean water. 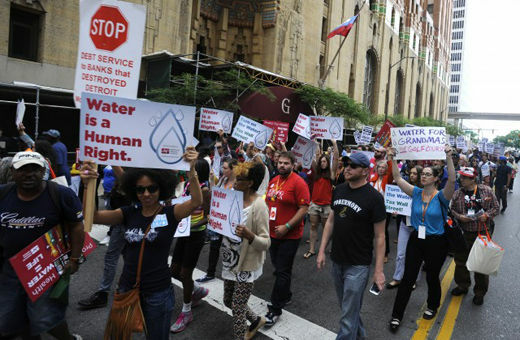 The Detroit water crisis began in March of 2014. The city of Detroit has been undergoing a long and painful bankruptcy, the largest in U.S. history. The Detroit Water and Sewerage Department (DWSD), attempting to shore up budget and other financial shortfalls, posted a five million dollar deficit. In order to bring their budget back into the black, the Detroit City Council unanimously approved an 8 percent raise in service rates. At the same time, DWSD began shutting off water and sewer services with little notice to people whose late bill was $150 or higher or if the bill was more than 60 days overdue. DWSD was shutting off customers at a rate of 3,000 per week. Some news estimates had the number of shutoffs at nearly 150,000 customers, nearly half of DWSD’s private customers. Imagine coming home from work or school and not having access to water for cooking dinner, or not being able to take a shower after a hard day’s work, or not even being able to use the toilet. Not surprisingly, public reaction to the shutoffs has been one of outrage. Outrage to the point where citizen advocacy groups have appealed to the United Nations for intervention in the crisis. The global attention focused on Detroit’s water crisis has been one more black eye for a city that has seen its share of hard times. However, this crisis is not something unique to Detroit. It has to do with the way we do business here in United States and how we, as a country, view utility services. 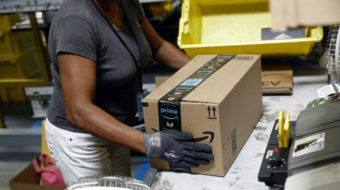 Most people would recognize that there are certain critical products and services that everyone has a right to, such as access to clothing, sustainable diet, emergency health care at the very least, education, police and fire protection, clean water, shelter, electricity, and heat in the winter time. The United States even recognized this when it signed, but Congress has not ratified, international treaties on the right to safe water access, agreements the citizen advocacy groups say are being violated with water shutoffs. The fact that these shutoffs occurred shows how two-faced our capitalistic society really is. We say that people should have access to all these undeniable rights that make us look good on the international stage. But when it comes to our own housekeeping, we still believe as a nation that utilities access, and shelter with a decent meal, should only be available to those who have the means to pay for them. One of the rumored reasons for the drastic nature of the shutoffs in Detroit is to generate a public push to privatize the DWSD. This has the potential to make future matters even worse. A government’s purpose is to serve and protect the people that live within its domain. A private corporation exists only to make money, and does so by any means that it can. Handing over a public service to a private corporation may look good on Detroit’s accounting books, but water and sewer services will still only be available to the rich and those with the means to afford them. To the poor and marginalized, water and sewage services will become a luxury if and when they can afford it. This crisis shows just how messed up our way of governance is. It only reinforces the fact that we need a government for all of society that will make sure people have access to services like clean water, instead of a profit-oriented society that provides for the wealthy and leaves the rest of us high and dry.